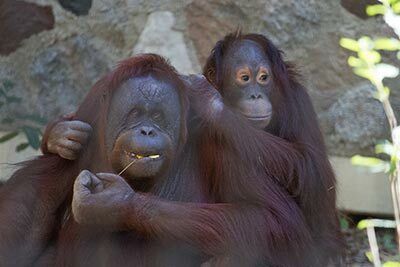 Beginning Saturday, January 5, the Milwaukee County Zoo will display a commemorative wall for Mahal, the orangutan youngster who died unexpectedly on December 29. When visiting the Zoo, the public is invited to bring along cards, thoughts and memories of Mahal and post them on the wall which will be displayed in the Primates of the World Building. Mahal arrived at the Milwaukee County Zoo in 2008 from the Cheyenne Mountain Zoo, to be introduced to MJ, the Zoo’s female orangutan. It was the hope MJ would serve as a surrogate mother to Mahal. It didn’t take long before the two bonded, and soon displayed a strong and stable mother/son relationship. A complete necropsy (animal autopsy) is being performed to determine the exact cause of death; final results are pending. The Zoo’s veterinary personnel believe the cause of death was pneumonia, as orangutans are susceptible to the serious respiratory condition, just as humans. For further information, please contact the Zoo Public Affairs and Services Division at 414.256.5466.